Phweet launched yesterday as a public alpha – this means it (mostly) works, but it probably still has many bugs to work out and has plenty of room for improvement. Escalate a Twitter exchange to Voice, quickly, easily, and without sharing new profile or contact info. Make the “signaling” about the call public, or semi-public (shared with our Twitter followers in this case), making a phone call a truly “social” thing (for the first time in history?) and potentially enabling instant ad-hoc “swarms” – vastly different from traditional pre-planned conference calls. These are big things, IMHO – but they only matter if the whole thing can be practical, easy, fast, and reliable. So my mission was to take Stuart, who always looks at the big picture (I mean REALLY big), and figure out to pull out from his grand vision, a bite-size nugget, something that could be implemented in the lifetime of a single human. I also felt that Phweet is something so new, uncharted territory, that nobody could predict what its reception would be. Therefore, it needed to come to life, and let people feel it and touch it, but without requiring an outlay of millions of dollars or years of development. Phweet generates a link (a URL – like tinyurl) and that URL is plopped into a Twitter message (or where ever, really) – and people click that link to start talking to each other. It really is that simple. Some things can go wrong, but when it works – and it usually does – that really is it. 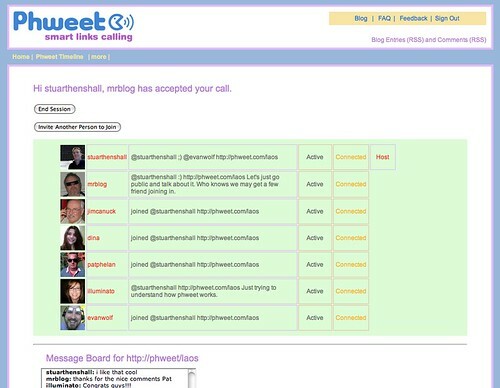 Furthermore, as noted in point 2 above, Phweet transforms a phone call into a social event, facilitating instant ad hoc “swarms” of people getting together in live real-time voice conversation, without all the hassle of setting up a bridge number, agreeing on using a certain tool/software, sharing all that contact info etc. Each person on a Phweet call can use the tool of their choice, such as SIP, PhoneGnome, Gizmo, Truphone (or, eventually, any phone, probably as a paid option) or simply use the integrated Tringme flash-based browser widget without installing any additional software or hardware. This lets people that don’t use SIP talk to those who do; and each person can use the “channel” (or method of connecting) that they wish, and nobody else on the Phweet needs to know what anybody else is using – you don’t need to give anybody your phone number, Gizmo account or any other such contact info. A Phweet begins as a person to person call, but Phweets are meant to be social and so any Phweet can be instantly transformed into a multi-party conference call. When you Phweet someone (or “send a Phweet” if you prefer), you can decide to make it “private” (sent with a Twitter “direct message”). In that case, you can still add people to the call, but only people you explicitly invite to the call can join in (and they must be following you on Twitter). If anyone else stumbles upon the link, they won’t be able to join the call or access the page. Otherwise, a Phweet is sent via the public twitter-stream (with a message such as “@phweet http://phweet.com/Gyfc India PhweetUp at 3 pm today. Join by clicking url.”) and in this case anybody that sees that URL (whether via Twitter, IM, email, or any other way) can click the link and request to join. The “host” (the person that initiated the Phweet) can then approve that user and let them into the Phweet. In other words, the Phweet URL can be sent to anyone, using any means available – it doesn’t have to be sent only via Twitter. In fact, on the world’s first public Phweet, several participants learned of the call via alternative means, including Skype chat and RSS feeds. Another aspect of using Twitter to broadcast Phweets is there is an automatic call history of sorts that persists in our twitter streams. It can be searched in all kinds of interesting ways (that link shows people who have joined public multi-party Phweets). One objective of a Phweet is to make the path from tweeting to talking diabolically quick and easy. And that’s what we’ve focused on in this alpha implementation. We got a lot of our inspiration from Twitter, where the focus is on simplicity and minimalism. Phweet is about getting people together on a call quickly, facilitating spontaneous, unplanned interactions, which is where the important decisions are made. I’m just excited! If we can help grow the conversation around Twitter and the market for Twitter conversations then we will help to build a bigger and better community! Plus why it is good and simple we can find out if all those guesses at the future and the five year road map are really going to come true! Very cool! I’ll have to show this to my colleagues at work, should be able to cut down on the phone bills!